I have pulled out the corrugated ribbing I started on the bottom of my Shetland Sampler Cardigan. It just wasn't working for me: it competed too much with the body of the sweater, it was too bulky, and it wouldn't lie flat. I have started again in a single color. You probably can't see in the photo, but this is a K2P2 rib. I'm much happier with it and knitting progress has picked up once again. Hopefully I'll get this finished before warm weather arrives! The gray really is much better, Leigh! The sweater looks great! Excellent choices all around! The whole thing is coming together beautifully. I have always worried about gray and brown together, but I can see that it is a very happy marriage! I'm on the last sleeve of my multi-colored sweater too....and I share your ambition to finish before warm weather arrives. Hope your ratio of winter to sweater works out well for you!! It looks great! Thank you one and all for confirming it! I'm in love with the project again. It's been slow because it's had a lot of thinking stages, and I'm glad I'm finally getting near the end. I really like the new ribbing. It look s really nice. Yup, I agree. The grey is a better choice. You take so much care and I need to take a lesson from that. I complain that my sweaters never fit, but I have never invested in a sweater the thought that you have invested in this one. I'm looking forward to seeing it - we all are! This sweater is working up to be a masterpiece Leigh! 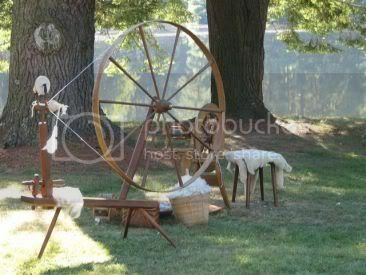 It looks beautiful, and when I think of all the fiber prep, spinning and designing calculations etc...AND knitting...I am just blow away by all the information contained in one FO. It is a true Sampler- a wonderful work of art! I'm so glad you decided to go with the gray. It looks really nice! 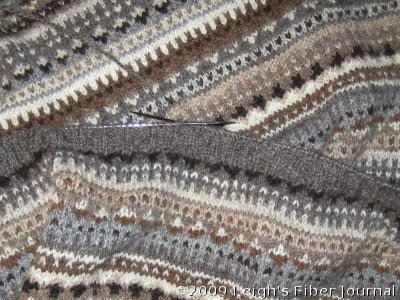 I like the grey much better than those stripes, looking forward to seeing the finished sweater now. Oh, it is going to be so "beautimus"! But then again, I guess I'm a little bit biased... Can't wait to see it finished up. T.
The gray looks great. The black would have probably been too much of a contrast with the rest of the sweater. Beautiful. Love the gray!! Just right. And always, Cyndy is right.